The competitive fellowships are intended to honor graduate students who are both outstanding scholars and outstanding graduate assistants. Recipients must be currently enrolled masters or doctoral students who hold at least a half-time graduate assistantship (RA, TA, or GA) and have completed at least three semesters of graduate assistantship experience. Recipients demonstrate outstanding scholarship and must have made a significant contribution or impact while serving as a teaching, research or administrative assistant. 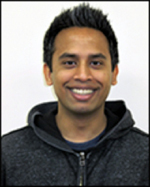 Datta is a research assistant co-advised by Associate Professor Pamela Abshire (ECE/ISR) and Professor Elisabeth Smela (ME/ISR). He is a homegrown member of the University of Maryland community: he received his B.S. from here and is currently pursuing his Ph.D.
Datta also is a Future Faculty Fellow and was a finalist for the 2011 Qualcomm Innovation Fellowship. He has also been an integral contributor to three invention disclosures submitted to the Office of Technology Commercialization. His doctoral research is on the development of a hybrid living and electronic nose. No device exists that can replicate the biological olfactory system, and there are numerous potential applications, including explosives detection, medical diagnosis, search and rescue, food safety, and manufacturing quality control. This multidisciplinary project includes components from electrical engineering, material science, MEMS, microfluidics and biology.